A black clutch is a wardrobe necessity, hands down. It is the easiest way to pull an ensemble together and the fashion gods weren’t kidding when they dispensed the wisdom that black does indeed go with everything. I’ve been holding on steadfastly to my black patent leather clutch with a gold turn lock from Elaine Turner, but I have now found a new love in Alexis Hudson’s Ciara clutch. It is oversized and sleek, which are two traits every New York City woman desires in a handbag. It works perfectly from day to night, while out running errands and then later on for drinks. The pebbled leather is stunning and the decorative lock hardware gives a touch of the industrial, while staying on trend for the season. A sassy french braid style à la Molly Sims. Maloles’ super chic nubuck and striped canvas “Lenny” wedges ($515). 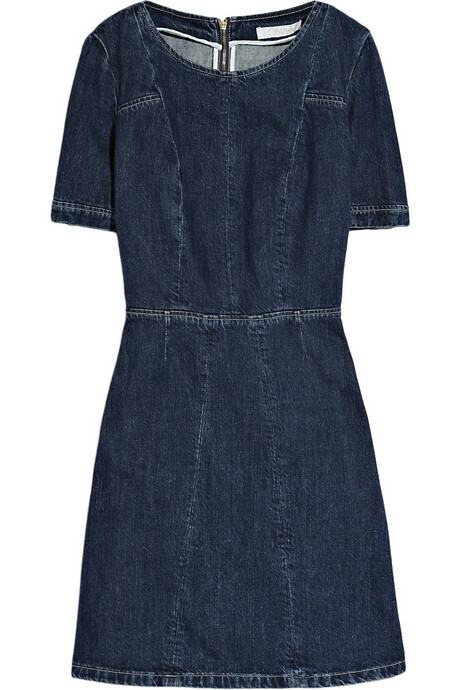 Chloé’s Denim Dress that will quite possibly last you the rest of your life ($625). Alexis Hudson’s Black Pebbled Leather Ciara clutch retails for $250. Visit www.alexishudson.com to purchase. *Molly Sims image courtesy of Huffington Post.